5. Hawkeye - A indie-comic disguised as a superhero one. Matt Fraction's Hawkeye kicked into high gear this year telling intricately laced stories that provided equal focus to both Clint and Kate, while presenting them in a form that would make Chris Ware proud. A ton of quality fill-in artists like Steve Lieber, Annie Wu, and most notably Francesco Francavilla were able to step in when David Aja wasn't able to keep up with the monthly grind, but none of them were able to top his tremendous issue #11: "Pizza is my Business". The canine meets detective story made for one of the biggest single issue highlights of the year. If there's a more inventive mainstream comic on the stands, good luck finding it! 4. Thor: God of Thunder - Marvel's biggest surprise wasn't a Jonathan Hickman-written high concept Avengers or Kieron Gillen's modern day teen romance comic Young Avengers, but instead was the Thor by way of Conan the Barbarian style adventures that Jason Aaron crafted in his run on this title. Teamed with Esad Ribic in its first arc, Thor teamed with his past and future self in a highly conceptual story where they battled a villain called "The God Butcher" who lives up to his name. This tale was a heavy metal album cover come to life thanks to Ribic's beautifully sketched out sword and sorcery style. The title then switched gears to a tale of Thor and a merry band representing each of the Nine Realms to stop Malekith's nefarious schemes in a story that looks more like a Dungeons and Dragon comic thanks to Ron Garney's capable draftsmanship. In between the two arcs, we get a quiet story where we see the impact Thor has on Earth to the people he interacts with, which as much as I love Hawkeye #11, I may prefer this one! Aaron is on fire with this title. 3. Battling Boy - Paul Pope once had an idea for a Kamandi series aimed at all ages, DC turned him down and instead he transformed that concept into something wholly original. Representing a sort of meld between Kamandi, Thor, Shazam and a number of other archetypes, I can't think of another graphic novel I had more fun reading this year. Pope's art has never been better, and his conception of Battling Boy, a young man who is sent from his trans-dimensional plane to Earth by his father as a rite of passage and is armed only with 12 magical t-shirts empowered by the animals that are emblazoned on them. Battling Boy has defend the citizens of Arcopolis from a giant car-eating monster after their native hero is killed by the shadowy villains that exist underground. There's a ton of energy is Pope's action scenes, but the central heart is also very strong, with a youthful voiced culled from Pope's own young relative. I can't wait to see the next volume! 2. 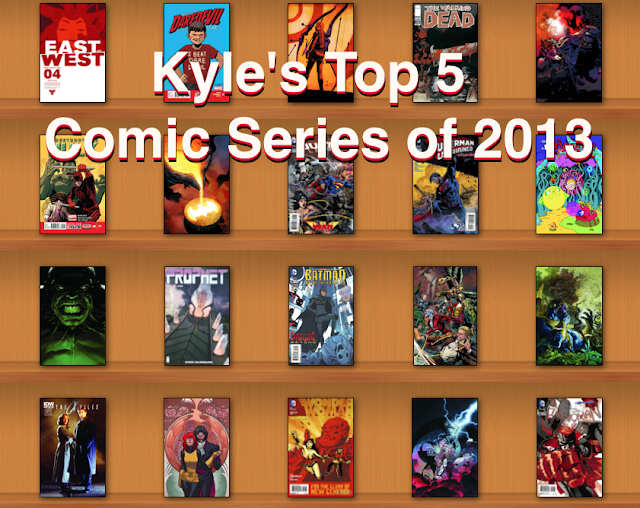 Fatale - Last year, Fatale was my #2 Comic of 2012, and here it is retaining it's title again for 2013. Whereas in the previous year, Ed Brubaker and Sean Phillips focused on what basically amounted to a very good Lovecraftian noir, in 2013 they expanded the palette. First, they focused on the history of the curse that affected Josephine, by telling EC Horror style tales such as a woman in the Old West who had a similar affliction, a medieval counterpoint, and a young Josephine meeting a stand-in for Lovecraft himself. The diversity on display in these stories was impeccable, and they followed it up with perhaps their best arc yet focusing on Josephine's life during the 90's Seattle Grunge Rock scene, when during an amnesiac phase she takes up with a band that's inspired by Brubaker's own life on the West Coast. This title continues to expand beyond its horror and crime roots, and it's one that I can't recommend enough. It is by far the most diverse series of their collaborations thus far. 1. Batman - There's no title I get more excited about every month than Scott Snyder and Greg Capullo's Batman. It's been an impeccable run thus far, with nary an issue that I would consider anything less than good. This year saw the conclusion of Snyder's impressive Joker story "The Death of the Family", giving one of the more interesting takes on the character's relationship to Batman, this was then followed by the staggering "Zero Year" arc, which redefined Batman's origin for the New 52. Rather than the standard Miller-inspired tale that most Batman origins take after, with Batman inspiring Gotham's criminals existence, instead the reverse takes hold. Batman is a response to the evil that Gotham can produce, such as the Red Hood Gang and Dr. Death. This has been a theme that Snyder has played with, even as far back as his seminal "The Black Mirror" storyline in 2011, and it is redefining how we look at the city of Gotham less as a place and more of an entity in of itself. It's a daring take, and he's assisted in this task by Greg Capullo and Danny Miki, producing lavish artistic spreads. This is the best of the New 52 and probably the finest superhero comic on the stands. It's certainly the one that occupies my mind the most.